Old school fashion has been making a comeback. Everything from mom jeans, scrunchies and matching sets are everywhere to be seen nowadays. Purchasing clothes at vintage and thrift stores is a big craze and there are plenty of gems hidden beneath the overwhelming amount of clothes they have to offer. The plus side is that these items are relatively inexpensive. In fact, to dress in a vintage fashion, the outcome is more cohesive if you purchase second hand clothes that have been around longer than your traditional fast fashion items. A little wear and tear can add some edge to any outfit. Ill be showing you three different outfits inspired by the retro era. 1. The first outfit has some hispanic flare to it. The delicate embroidery on the collard shirt resembles something your grandma would wear, but in the best way possible. I bought this piece at the Salvation Army and fell in love with it the minute I tried it on. This shirt tucked in to any pair of pants completes even the simplest of outfits and the best part is that it only cost eight dollars! 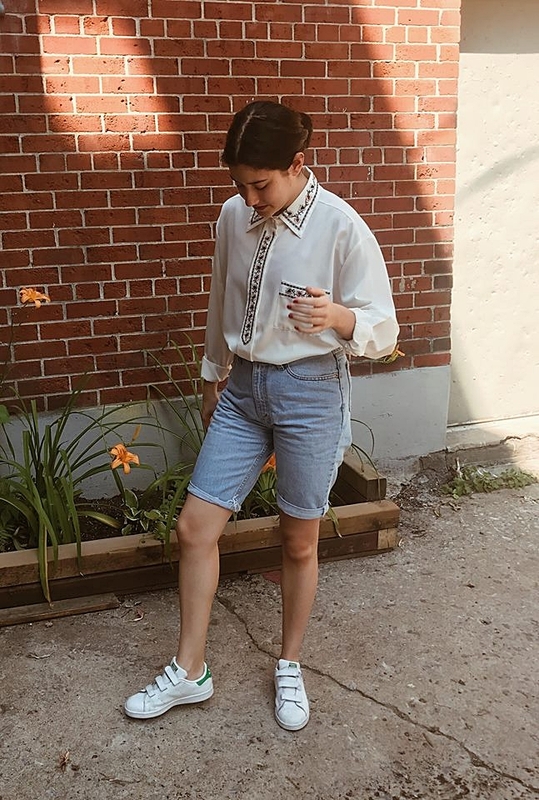 These bermuda shorts are from Levis and I purchased them at a local vintage shop called Eva B, here in Montreal. Levis is known to have some of the best vintage denim on the market. They can sometimes be expensive and I recommend scouting your local thrift stores to find an affordable pair. These were originally a pair of jeans that someone cut into shorts and the outcome could not have been better. The cuffed bottoms as well as the light wash color adds some vintage flare and definitely makes you look like you just came out of the nineties. These Addidas shoes are extremely comfortable and go well with any outfit. At school, I would actually get teased for wearing velcro sneakers. People would ask me: "Do you not know how to tie laces?" and I would simply respond that I was making a fashion statement. These shoes have a certain nostalgia to them and are unlike your traditional sneakers. The best part is that they're actually sold in the junior Addidas section. The velcro aspect is a major throwback and I enjoy how underrated these gems are. 2. The second look is more feminine and simple. When I think of the seventies, eighties or nineties, midi skirts always come to mind. This traditional style isn't as popular now as it was back in the day since people wear mini skirts more often. Pairing a midi skirt with a fitted top is a classic way to look like you elegantly came out of another era. I also accessorized this simple outfit with a gold necklace, purple stone earrings and a gold bangle. You either love or hate Birkenstocks. I happen to love them since they compliment any summer outfit and are comfortable to wear. Fun fact, the Birkenstock company was founded in 1774 and became very popular during the 1960s and 70s. Needless to say that these shoes are timeless and have been around longuer than any of us. If you want a sandal that you can easily slip on and feel comfortable in, I would highly recommend purchasing a pair of Birks. look at that pinky go! 3. The last outfit has more of a relax, casual feel. 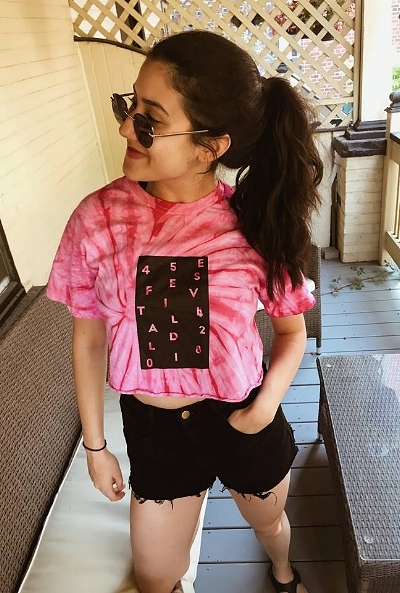 Anything tie-dye really brings back the age of the hippies and it's easy to even DIY any white tee-shirt in order to achieve the effect. I paired this cropped tee with some black high-waisted shorts that I cut in order to fray the ends. This outfit demonstrates the more casual side of fashion during the different eras and is something anyone can wear when they're out and about. My sunnies are from Urban Outfitters. Seriously, why does my hand freak me out?? Vintage fashion has always been carefree, fun and eclectic in its own way. Some of the most iconic fashion statements were made before the 2000s and the people back then who were just dressing for fun didn't realize that their style would be idolized later on. With that being said, I hope this inspired you to dress behind the times. Don't forget share and leave a comment if you enjoyed!